....and opening an album reveals a photo journal-like view with the description alongside each thumbnail. 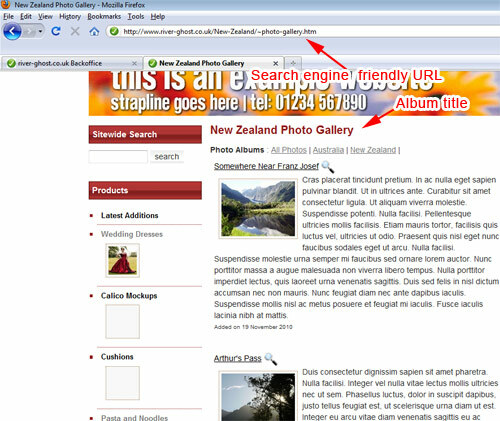 Clicking on the photo title will take you to an exclusive page for the photo (all optimised for search engines). The magnifying glass opens up an enlarged lightbox view of the photo. Overall it's a much more search engine friendly, photo journal-like version of the photo gallery. The other two versions of the photo gallery (standard HTML & Flash versions) remain the same - this is just an optional extra - useful if you want to categorise things like case studies, projects etc that are more a mixture of photos and text (with ability to zoom in on images).